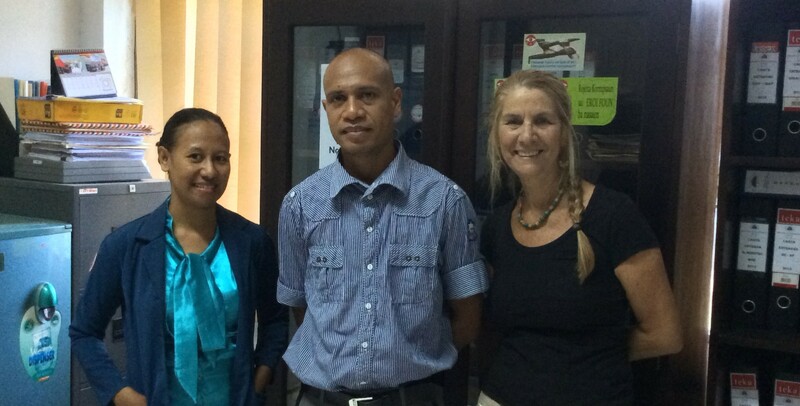 In April 2015, Lorraine McBride, Victorian Facilitator for AusTimorFN visited Timor-Leste for three weeks. Her visit was part AusTimorFN work and a catch up with old Timorese friends to hear the local news and gain a sense of the direction of the new sixth constitutional government. Lorraine was also focused on ensuring that positive communication mechanisms were in place for Friendship Groups as decentralisation is rolled out in Timor-Leste. In the recent government re-structure, Sr Abilio Caetano, General Director for Administrative Decentralisation at the Ministry of State Administration was given responsibility for the Friendship Groups (as reported in AusTimorFN eNEWS on 20 March 2015 – click here). Although his schedule was very busy, partly due to his impending trip to Melbourne, Sr Abilio made time to meet with Lorraine to discuss the best way for Friendship Groups to communicate with his office and to continue to do their important work in the Districts. Sr Abilio identified a liaison person from his office that the Friendship Groups should contact when visiting Timor-Leste. In this way his department will stay informed of the activities of each Friendship Group. Sr Xisto Freitas (Media Officer for Decentralisation) is the new Friendship Liaison. Sr Abilio has requested Friendship Groups to advise Sr Xisto what tasks or activities they plan to undertake when visiting their friendship area. This encourages mutual respect, transparency and accountability from both Friendship Groups and local communities. It also provides the Ministry of State Administration (ESTATAL) an overview of the ongoing development projects that friendship groups are implementing in Timor-Leste. Subsequently, Lorraine spent a morning with Sr Xisto to give him background knowledge about Friendship Groups and the wide variety of support they provide throughout Timor-Leste, as well as their local council links. A special folder was set up with the list of the 37 registered Friendship Groups, so that information on their visits could be collated. In discussions with Sr Xisto it was determined that a standard visiting form would make this task easier for everyone. A copy of the Friendship Group Visit to Timor-Leste form can be downloaded from our website here. Sr Xisto’s full contact details can be found here. Sr Abilio has a long history with the Friendship Groups and re-iterated his appreciation for all the Australian friends who do great work in Timor-Leste.